USBCrypt™ is a powerful software encryption utility for Windows 10, 8, 7, XP that protects your sensitive information from unauthorized access. It locks the bad guys out, and protects your personal, business, and financial data. Unlike other encryption programs, USBCrypt is closely integrated with the Windows shell. This makes working with encrypted drives easy and intuitive. The drives encrypted with USBCrypt can be used with other Windows computers, even if they don't have USBCrypt software installed on them. You can use USBCrypt to protect your files if you use a removable disk to move the files between your office and home. This is especially important if your work files contain confidential company information, or private information about your clients: losing such data without encrypting them could spell disaster for your business or career! USBCrypt can help you protect the privacy of your data. If you use a removable drive to keep the backup of your files, you don't want it to get into the wrong hands. 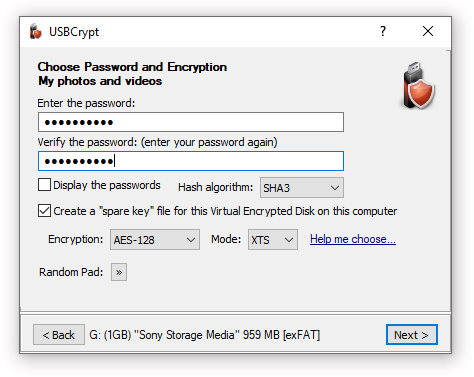 With USBCrypt, you can create a Virtual Encrypted Disk backup your files directly to the encrypted storage area. If someone gets hold of your external drive, s/he won't be able to extract your backup without the password. USBCrypt can keep your personal files secure, too. What if you lose the flash drive with your vacation photos somewhere away from home? If you have encrypted it with USBCrypt, you can sleep well knowing your private files won't appear on some shady web site. USBCrypt keeps your sensitive files safe. USBCrypt works with drives of any type. USB thumb drives, flash memory drives, portable hard drives, internal hard drives - you name it. If your computer recognizes the drive, USBCrypt can encrypt it. USBCrypt works with drives of any format. Attention System Administrators: USBCrypt is enterprise-ready! The USBCrypt Administrator's Kit is available now. You don't need to know if your computer has NTFS or FAT/FAT32 drives, because USBCrypt can handle both, automatically. It can create NTFS-formatted Virtual Encrypted Disks on the FAT-formatted drives and vice versa. Again, if your computer can handle it, USBCrypt can work with it. USBCrypt can handle drives of any size. USBCrypt runs on a wide range of Windows platforms. USBCrypt runs on any Windows computer. You can install USBCrypt on any computer running one of the supported versions of Windows: laptop, desktop, netbook, tablet, workstation, or server. If it can run Windows, it can run USBCrypt. USBCrypt is easy to use. Whether you're an experienced computer user or you're just learning how to use Windows, you'll appreciate the simplicity of USBCrypt's interface. When you attach an encrypted drive to your computer, USBCrypt puts an icon in the taskbar, giving you easy way of controlling the encrypted disk. When you enter your password, the color of the icon changes to indicate that the encrypted drive is now accessible. And so on: USBCrypt makes working with the encrypted drives easy and intuitive. You don't have to be a computer professional to understand how to use USBCrypt. USBCrypt User's Guide describes its commands and operation in plain English, without "pseudo-techno" or "geeky" talk. (And it does not baby-sit you either). We offer corporate customers a special version of USBCrypt that does not require license validation over the Internet. The USBCrypt Administrator's Kit contains the installation files in both the EXE and MSI formats, allowing the system administrators to quickly deploy USBCrypt to a large number of computers. The Kit also contains a Group Policy template that you can use to automatically deliver the license key to a large number of the client computers. It can also be used to restrict the commands of USBCrypt.